The bands 4th album, The Haze was released in March 2017 and reached number 12 in the charts. It is believed no material was recorded as the band performing as a 3-piece. 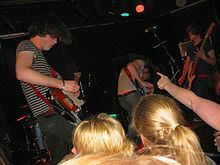 After their formation in early 2008, the band regularly rehearsed above 'The Packhorse' pub in Leeds which was also where they performed their first secret show to a full house of attendees who had been invited by text message at the Packhorse in Leeds on 12 February 2008. When the second record Tough Love was released in 2011 the band then went out to play a headline tour in the UK & Europe to support the record from February to April which included a sold out show in London at the Electric Ballroom. Later in 2012 the band announced a full UK tour for November which was then announced as being pulled from the band's website due to 'unforeseen circumstances'  but it is believed the band was concentrating on their third record. Once the band became busy with frequent touring in the UK & Europe they self-released 500 copies a 5 track CD which was only available at shows whilst they were securing a record deal. A second run off 500 were made in early 2010 prior to their debut record release. Their critically acclamied third album Blood was released on 1st September 2014, after receiving a wave of notable reviews, the record entered the Top 40 Official UK Album Charts at 38. The 4th studio album The Haze was released 17 March 2017, this record saw the band return to their roots and enter the album charts at 12. The band have begun recording their 5th studio album, but no details have been revealed of its release so far. 2009 "I Punched A Lion In The Throat / The Crapsons"
"High Five, Swan Dive, Nose Dive"
^ Horses, Pulled Apart By (2018-10-08). "It's that time again #pabh5 pic.twitter.com/2bYvcdzI5a". @pabh. Retrieved 2019-03-05.